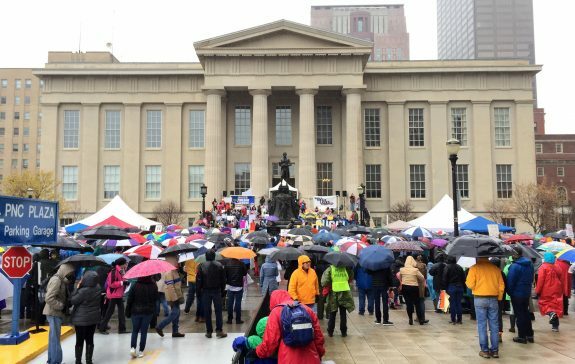 Hundreds of Louisville Students and Their Supporters March For Their Lives– and Ours. It was a dark and stormy afternoon last Saturday when as many as a thousand or more Louisville students, their families, and supporters marched a cold wet mile up Main Street to Louisville Metro Hall where a spirited rally was held. One could only be impressed with the student’s passion and justifiable anger. (I was taken back 50 years to the protests of my generation against the Viet Nam War.) The students had a right to be angry. In addition to the apparently unstoppable drumbeat of shootings here and elsewhere, the day before the march a student brought a loaded gun into Louisville’s Valley High School, and a credible threat announcement was made against Manual High. This is not somebody else’s problem. We own it too! Similar protests took place all around the country. In Washington, DC, the turnout was impressive, and may have been the highest for a one-day protest ever. Despite the passion and powerful rational rhetoric of the students, pundits are generally pessimistic that little more than cosmetic changes will result in the near future– if not the foreseeable one. I suspect however, that weaknesses in the defenses of the NRA/Industrial complex and their legislative partners are forming. Some in the Republican party and other NRA enablers of any party must be at least a little nervous. The students know that they will soon be able to vote, and I suspect they will not have forgotten the promises they are making today. If you were one of their parents, why would you not support them? I believe if this generation of students can keep it up, that change is possible. It is already starting to happen! The spending bill signed by President Trump a few days ago reversed the previously unexplainable prohibition of federally sponsored research into gun violence. Now that such violence is a formally recognized issue of public health, I have a legitimate justification to write about it in these pages! I confess to feeling a twinge of sadness from one statement in Ms. Kuhn’s speech when she told opponents of reform that it was not a goal of the students “to take your guns away.” She is not alone in accepting this narrowing of possible outcomes before the debate has truly begun. A principal goal of a think tank, lobby, or advocacy group is to establish what issues are on the table and to define the vocabulary of any political debate. To be able to do so is to win. This has been a great success of the NRA. Taking the possibility of decreasing the number of guns in our country off the table is premature, indeed an abdication. In my opinion, and as is becoming even more clear to me as I pay attention to the daily reports of gun violence, that the suggested reforms already on the table will not have a significant impact. Of course the mentally ill should not be able to buy guns, but neither should they be able to own the guns they may already have. Indeed, how do we decide if someone is mentally ill? I lived in mental hospitals for 13 years and assert from experience that there is no bright line between normal and mentally ill. There are not enough mental health workers in the world to do all the checking necessary– even if we had accepted criteria to turn someone down. There are not enough FBI agents or similar investigators in the country to do all the background checks necessary expose past criminality or violence, let alone a reliable, accessible registry for them to use. An individual defined as sane or reliable at the time of purchase may not remain so in the future. Having teachers carry guns makes no more sense than having flight attendants do so. Shooting galleries in planes or schools make for collateral damage. Even if schools become armed citadels, airport-grade security procedures will still be necessary. If visitors with guns are not permitted in the Senate or House chambers, why should concealed or any other carry be permitted in a public place anywhere? [What is good for the goose…?] How long a waiting period is necessary before buying a gun legally? Is there a shred of evidence that any waiting period will make a dent in gun violence? There are just too many guns lying around for the mentally ill, the criminal, or the angry to pick up and use. I remain to be convinced that anything other than decreasing the number of handguns and weapons of war in private hands will diminish gun violence in any meaningful way. I walked away from Saturday’s rally feeling that a glimmer of hope had been lit. 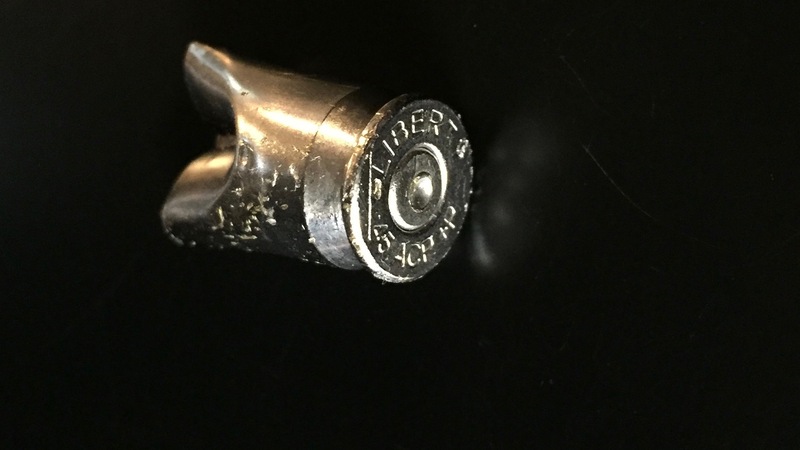 However, my uptick in enthusiasm was dashed when upon turning the corner at 4th Street on my way back to my car, the visible glimmer on the ground turned out to be a spent 45-caliber bullet cartridge lying in the street. Thus the pendulum lurches back and forth. Change will be neither easy or quick, but the experience of other countries tells us we can do better. We need to start somewhere and its painful to imagine things could get worse. Previous Previous post: How To Save Big Money on Prescription Drugs. Next Next post: Second Cardiologist Found Guilty in Federal Court for Performing Unnecessary Cardiac Procedures at St. Joseph London Hospital.